Designed to fit and complement your notebook, these sleeves offer plush-line fabric notebook compartments to keep your notebook secure and free from scratching. 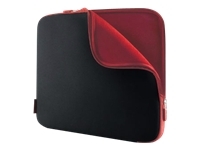 Its unique, asymmetrical zipper design makes it ideal for easy access to your notebook from the top or the side. You can use the sleeve inside another bag for easy carrying or on its own for on-site use.